The 40 guest rooms at the 3 star hotel Valle are well-appointed and have recently renovated and improved with the addition of new classic furnishings and some ultra modern facilities such as broadband internet connection (via your own lap-top computer). 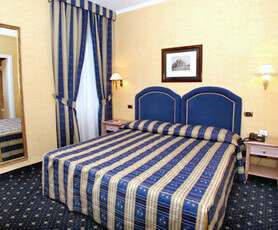 Choose from single, double, twin, triple and quadruple rooms. All guest rooms at the Rome Hotel Valle contain unique décor including tapestries and paintings which reflect the ancient part of the city in which you are in. The bed-covers elegantly match the wall furnishings and the combined result is an atmosphere of intimacy, charm and elegance. The 3 star Hotel Valle provides private en-suite bathrooms in all of the rooms which are made from the famous Carrara marble. Air conditioning, central heating, satellite and pay tv, safe, mini-bar and complimentary bathroom accessories complete the facilities on offer at the Hotel Valle Guest Rooms. Breakfast – breakfast is included in the room rate and is served every morning from 7 till 10. guests may help themselves to a continental style buffet breakfast which includes cereals, fruit, ham, salami, cheese, coffee, tea, fruit juice and fresh croissants. Staff : our pleasant and cordial staff are always at your complete disposition in order to make your stay in Rome as memorable and enjoyable as possible. We can help you organize your sightseeing including the purchase of tickets for the open deck bus tour of Rome, a night at the Opera, concerts, rugby and football matches. Parking : Due to our hotel’s location in the city centre of Rome we cannot offer you any free hotel parking, we can however, offer you a parking space in a nearby garage for a small daily supplement.